A singular event along the route, taken in stride at the time as an ugly part of the war no one would believe except the men witnessing it, occurred on 3 and 4 April as firing units outran their command posts and seized on opportunities to advance. That event was the discovery of the first Nazi Concentration (death) Camp liberated by the American military troops in WWll. An eye witness account by the author appeared in the March/April, 1995 issue of the Michigan History Magazine published by the Secretary of State, Lansing, Michigan, pp. 46-47. 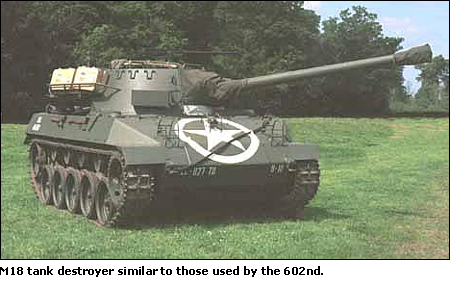 He said, "During the late afternoon and early evening of April 3, 1945, I was sent by the commander of Company A, 602nd Tank Destroyer Battalion (then attached to the 89th Infantry Division), to reconnoiter an area approximately one mile ahead of where our seventeen-ton 76mm M-18s had stopped. The purpose was to determine if the terrain would support our heavy tracked vehicles. The topographical map showed a low area preceding a hill and high ground north of the German city of Ohrdruf. Shadows were long when my driver and I, a reconnaissance sergeant, entered a valley with a steep, wooded hill on the east side. We parked the jeep new- an old shed-like structure and got out to test the firmness of the ground when several shots snapped over our heads and slammed into the shed several feet behind us. We hit the ground and me with my carbine and the driver with his Thompson automatic sub-machine gun sprayed the hillside from where the shots had come. Soon white flags appeared from what looked like a trench near the top of the hill. We took five prisoners, from there-all were SS men. My driver held the automatic on them while I searched them; taking weapons, ford and anything else they had on them. They reeked with an awful odor; we remarked to each other that they must have been from a Calvary unit since we had overrun and helped cut up one of those a day or two before. Later that night of April 3, Company C, 602nd Tank Destroyer Battalion was placed under control of the 4th Armored Division for the April 4 attack. As daylight broke, the company attacked into Ohrdruf. My battalion's other companies were attached to the 343rd, 354th, and 355th Infantry Regiments of the 89th Infantry Division. My company (A with the 353rd Regiment) was held in reserve. Company B and reconnaissance units were to attack east but toward the north around the hill. That would leave a gap of a mile or so between them and Company C's route into the city in front of where Company A was located. I was asked to reconnoiter the area to see what might be out there. The attack began just before daybreak. I went around the hill on the south of where we had taken the~ German prisoners the evening before and up on the slanting but higher ground. At about daybreak a lone German plane flew over and dropped two bombs, which landed just north of me. Soon after, I heard bursts of German small-arms fire to the north and behind me. Then I heard the sporadic bursts of our 50-caliber machine guns. I headed in the direction of the shots in my jeep that had a 30- caliber machine gun welded on a mount by the passenger seat. As I got to where I could see in the distance of 50 yards or so what looked like a brown wooded fence, a German Command car left hurriedly to the east, and one of our M-18s came slowly around the northeast comer of the structures and smashed through the brown wooded fence on the southeastern side of the facility, while several German soldiers ran east into the woods. One soldier clattered toward us and our 30-calibre worked well, as usual. A second M-18 appeared, shooting in the direction of the fleeing soldiers. I went through the hole in the fence into the compound behind the first M-18 and quickly understood the reason for the German small-arms fire. The bodies were all there in a pile. As the sun rose, I grabbed a camera I had picked up earlier off someone's table and took pictures of the pile of lime-covered bodies in a shed, as well as the pile of freshly killed people, including one with American air corps boot on. My driver, who was Jewish, talked with one of the two survivors, who told him where the mass graves were located. We left promptly for the burial pits, each of which was seventy-five to one hundred yards long. Along the sides were burning pyres with partially burned pieces of bodies they had not yet scraped into the ditches. I took pictures of the bodies. At Eisenach, numbers of prisoners taken were Company A 86 enemy with one truck and 9 machine guns knocked out. Company C 50 enemy and one anti-tank gun, Company B 10 enemy, and Recon. Company 7 enemy. On the 11 April Task Force Crater composed of Company A 602nd T.D. Bn., 707th Tank Battalion, a Battalion of Infantry and a company of 314th Engineers was formed to seize bridges over the Salle River, The 60200 took 28 prisoners and B Company had one jeep and one M-18 damaged by artillery, Task Force Crater was dissolved 14 April. Typical of the working relationship between the 602nd and 89th Regiment are events on 16 and 17 April. On the 16th Company A Headquarters Platoon moved from hla, while the CP moved from Triptis to Langen-Wetzendorf and each platoon was in position and supporting the 353rd Infantry Regiment on the drive. The 1st Platoon supported the infantry across the Weida River. A small amount of artillery was encountered, but many prisoners were taken without resistance. We took the village of Tries after firing a few rounds of 50-calibre and moved into Griez where we slept in a hotel there. On 17 April as the CP and Headquarters Platoon moved from Mehla to Reichenbach, cook Roy Barger captured 6 enemy. The 1st Platoon supported the infantry in an assault on the town and fired 10 76mm shells into enemy observation posts in a tower. At two p.m. the 1st Platoon crossed the Elster River, and at 3 pm. the town of Reichenbach surrendered. Regiment 353rd men were shuttled into town on our vehicles. Then we crossed the Autobahn to Waldkirchen where we liberated approximately 100 American and 70 British prisoners of war. On April 18, between 2 and 3 am in Unter-Heinsdorf,, a guard observed 2 enemy officers and fired on them hitting one the sitter downer. 70 British prisoners of war. On 18 April between 2 a.m. and 3 a.m. in Unterheinsdorf, a guard observed 2 enemy officers and fired on them hitting one in the sitter downer. On 27 April, the 602nd T.D. Battalion was relieved from assignment with Patton's 3rd Army and attached to the 1st U.S. Army. In the period 18-30 April platoons of firing companies took turns being in reserve or on the line, just in case. Rest, maintenance, and recreation were the activities of the day with movies being shown and passes given. On 24 April the Battalion received official instructions on recognition of Soviet Ground forces, but there were no reports of any contact. On 21 April a report came in during the afternoon that Russian prisoners in Zwickau had been fired on by SS men in civilian clothes. Three M-18s in the Battalion Motor Shop and several armored cars were dispatched. It proved to be a case of the armed civilian guards firing on the Russians; nothing serious developed. Up until the 2nd B Company reported having knocked out one anti-tank gun, 3 trucks, 22 enemy killed, and 70 prisoners taken. On the 23rd VIII `Corps passed to control of the 1st Army. On 3 May one platoon of B Company was sent to break up an enemy concentration in front of the 354th Regiment. B Company knocked out one observation post and killed 3 enemy. The next day the same thing happened and B Company knocked out a machine gun, an observation post and killed or wounded approximately 20 enemy. On 8 May 280 prisoners surrendered to Company B, and the war was officially over.